We listed up our recommendations for you ! 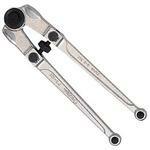 MonotaRO offers pin spanner wrench tool and more. You can buy them anytime from our Singapore online store. See more results of "pin spanner wrench tool"
Office Stool and Step Stool and other recommendations. You will find Folding Step Stool and Working Step Stool and more ! Explore more from our Steel Wire Plated Cup Brush and SUS304 stainless steel umbrella-type brush store ! Wrapping Paper and Waterproof Wrapping Paper and other special offers. Tool Box and RVBOX and other special offers. Want Snap-in Valve and Snap-In Valve ? Click Here. Our popular products as Mop Wringer and Mop Set With Handle Yd1054 can be viewed here ! Watch Glass and Watch Cap are also chosen. Square Head Tapered Plug and SUS and other related products.